They say that all's fair in love and war, which is exactly why Butch the Mutt is up to some K9 Capers in his courtship of Penelope Poodle. Click here to play! He's a hard-on-his-luck stray with no pedigree, and she's a classy French pink poodle that gets more expensive beauty treatments than most humans. Needless to say, Ralph has his work cut out for him. In the K9 Capers slots, you can help Butch the Mutt win the heart of his dream pooch by finding him all sorts of presents to give to Penelope. He's good at poker (you know that painting of the dogs? Yeah, he posed for that) so helping him win hands at the table is a good start, but that will only go so far to impress Penelope. You need to find teddy bears, His and Hers dog bowls, a brand new dog house, and a fancy collar that Butch can present to Penelope to prove he isn't just some mongrel. If you help Butch out, he'll reward you by showing you where some robbers on the run buried their bank heist. Who knows when they'll return, though, so you'll have to start helping Ralph on the K9 Capers slots right away! The French Poodle symbol is the scatter for this game, paying out on the total bet and triggering a bonus game. When paying out on the total bet, the scatter pays 2 times the bet for 2 symbols, 5 times the bet for 3 symbols, 20 times the bet for 4 symbols, and 100 times the bet for 5 symbols. The Butch the Mutt symbol is wild and can substitute for any other symbol, but it only appears on reel 3. 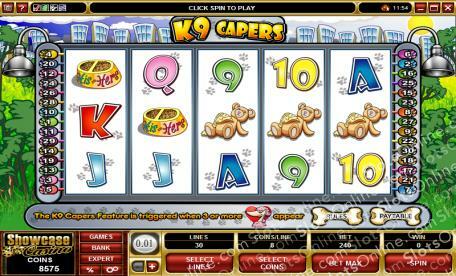 When 3 or more French Poodle symbols land on the reels, the K9 Capers special feature is triggered. In it, the player helps Butch to find the French Poodle, revealing a bonus prize amount. There is also a gamble feature that allows the player to put up a win as the stake. The player then tries to guess the color or suit of a playing card. A correct guess of color doubles the stake, while a correct guess of suit quadruples the stake. Incorrect guesses forfeit the stake entirely.